Come gather round the fire and let me tell you about a tail from a mouse called Colin, who fought an evil Queen to free his father from her vicious clutches. Let me fill your head with wonder as Colin and his team fight off rats and spiders and the kitchen cat, and collected mountains of cheese on the way. You too will learn of the courage of rodents and the dangers of crystal caves and sewers and insects. For this is the story of Mice and Mystics by Plaid Hat Games, and like all fairy tales for children, what a brutal tale it becomes. It always struck me as strange that in the years since Heroquest set fire to the cup of joy in my heart, there was never really a natural successor that took on the mantle of dungeon crawling and got as close to the magic. The likes of Advanced Heroquest was so caught up in introducing you to a 2000 page rulebook and the joys of Games Workshop, that it kind of fell down the stairs of accessibility and banged it’s head, forgetting where it was meant to be going as a sequel. 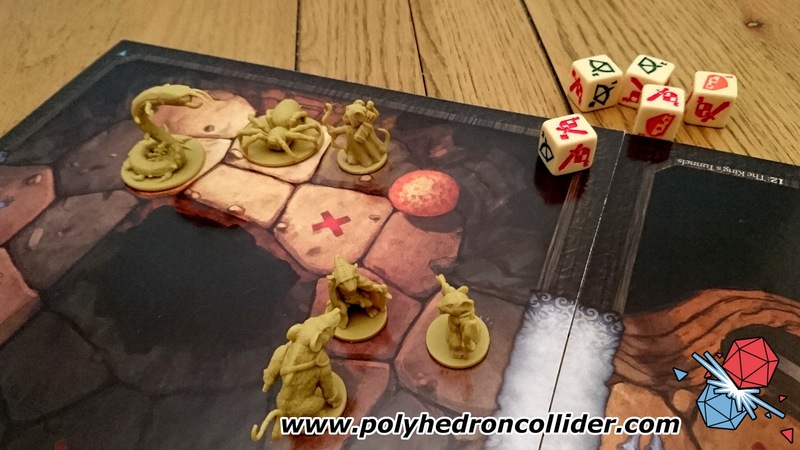 Fast forward a couple of decades later, to where the designer of Mice and Mystics, Jerry Hawthorne took on that challenge and delivered a high quality board game of charm and imagination. Let’s start from the off, Mice and Mystics is lovely to look at, and the components justify the reasonable sized price tag for getting it to your table. Everything from the double sided boards to the miniatures are stunning to look at, and it’s clear that a lot of time has been put into making the game the best it could be. 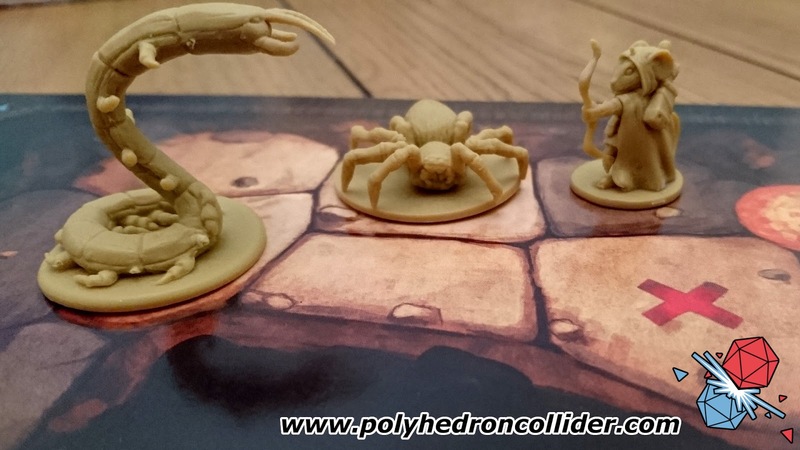 The detail in the protagonists are excellent and I’ll not hold it against you if you found the spider miniature a little too lifelike to spend too much time on the table. What you have is an interactive story played out in a series of chapters, where Colin and his merry band of rodents use an array of equipment and weapons to battle and explore their tiled environment. Each chapter requires you to use different double sided tiles in order to create a scenario and sometimes you’ll use both sides as you traverse between levels in a twist that can add a bit of verticality where other games rely on a single plain. Different chapters will often introduce new rules that have to be followed and not all of them will be repeated in later levels so you’ll often need to have the gameplay chapter book open and ready for reference most of the time. It’s a stunning book, gloriously illustrated and extremely well written. 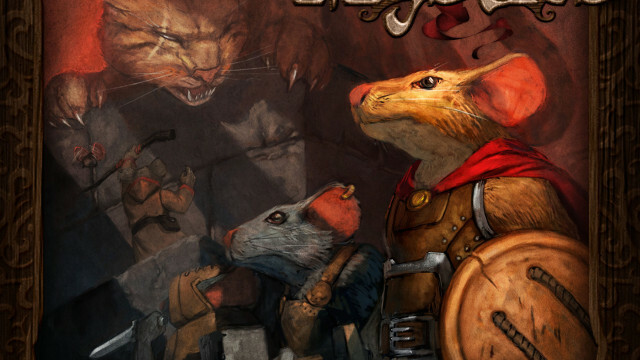 Mice and Mystics tries to be inventive in its approach to standard dungeon crawling fare and, in terms of presentation, it's a charming success. 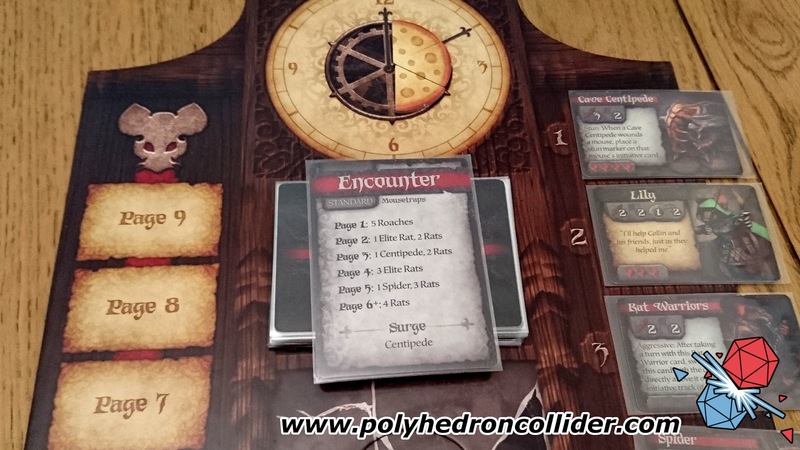 The initiative track is a charming looking grandfather clock where the allies and enemies turns are tracked by the order their information cards appear up the side of the clock. The face of the clock is used to show wedges of a round cheese that once the sections are completed, will trigger an additional spawn of unwanted creatures. Cheese is also collected by the heroes in order to buy extra skills they can use which means that rolling one on a die can lead to joy or difficulties, depending on the outcome. You have choice of actions, like searching for equipment or entering battles or scurrying to move quicker, and all are required if you want to succeed. This is because, for all of the storybook friendliness and the delightful design of the miniatures, Mice and Mystics can be punishing, tough and occasionally a slog to finish a level. Those who forget to search for new equipment, or upgrade their skills as quickly as they can, might find themselves overwhelmed and overrun by some of the simplest of enemies. Unlike other dungeon crawlers, you can’t simply crawl to another tile if the battle is starting to go against you, as the the rules require a complete clean up before you can move on. So a full cheese wheel or a couple of bad dice rolls can leave you struggling to progress, sometimes having to playthrough a level a second time. This time you might have a different encounter card with rats instead of cockroaches, or maybe you’ll luck out this time and every tile you enter has one treasure after another. This is maybe Mice and Mystics’ biggest flaw, because unlike a children’s story where the most unlikeliest outcomes happen 9 times out of 10, there are simply too many chance based systems in place. They can leave you feeling that a good win is down to luck over skill, and that a bad loss is never down to poor choices but rolling a cheese wedge over rolling a sword. So like the classic bedtime stories you hear, you’ll often have your own spin, maybe make your team automatically win against some enemies if you are playing with the kids, or pick the encounter card you face for the round. You might go as far as seeding the equipment deck so you get can prepare yourself for the toils ahead. As much as it screams out in its presentation that Mice and Mystics is the family dungeon crawler you’ve been looking for, the reality is that sometimes it plays like someone has sneaked a book on theoretical physics into the children's section of the library but added a fairytale cover. It is challenging enough for those who are looking for a bit more bite in their game sessions. For those who are willing to take their time and play the game by its own rules, you’ll be looking at one of the most stunningly presented and lovingly created games you’ll play. For those who prefer to rush in and hate putting success down to luck then Mice and Mystics is a tale you should maybe leave on the bookcase. Richard has been playing boardgames since the days of Lost Valley of the Dinosaurs. After a small break to let life get in the way, he dusted off his love of cardboard and now not only plays, but talks to people about it on the second best boardgame podcast, We're not Wizards. He thought it would be best to pollute someone else's site with his writing in case it was rubbish.